Looks like his high school team played better without him this season. However, I am all on board for a local kid. Would love to see him don the cherry and silver. Solid in-state recruit. Looks like he could add height too if he's only a sophomore. its great that we are on an in-state kid with real d1 potential this early. We went to a lot of Santa Fe High games this year. He is a great player, has a great attitude, and doesn't try to steal the show or make it all about him Played amazingly within the system. He ok. I like he’s a local kid. Needs to get allot stronger. as only a soph, wouldn't one expect that. at about 14-15-16 most boys are not even close to filling out or being anywhere close to physically mature & being 6'6" at that young age just exasperates that situation. I'm thrilled there is a NM kid this young at this skill level that our coaches are on and not taking for granted or assuming that just because they are from NM they can't play at this level - we will be lucky if he chooses to come here. Actually he needs to grow up when it comes to his attitude. He gets a lot of stupid technicals because of his attitude. He is young and should learn from his mistake. I believe he will. I hope he recovers 100% from his injury. It's a tough injury that can reoccur if not rehabbed correctly . Takes a year but they are pushing him to play this summer. I remember when Terry Armstrong was on his official visit and he also visited during that time. Seemed like he really was a heavy Lobo lean at that point. 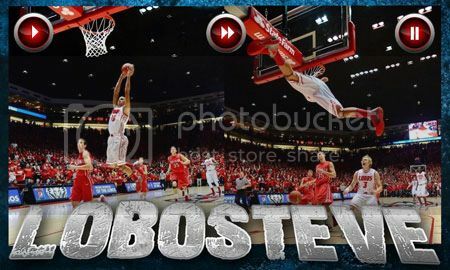 Hopefully, he stays healthy and continues to keep the Lobos in his top selections. Looks like a good recruit. Two years of highschool ball he could turn into a big time recruit. They were 12-0 and ranked 1st in the state before his injury. Both their big men got injured. With them they would have cruised to the state championship.